Searching for the perfect gift for Valentine's Day? Advanced Plastic Surgery Center compiled this list of four fantastic facial treatments including Botox, Juvederm, Lip Enhancement, and Cheek Augmentation. 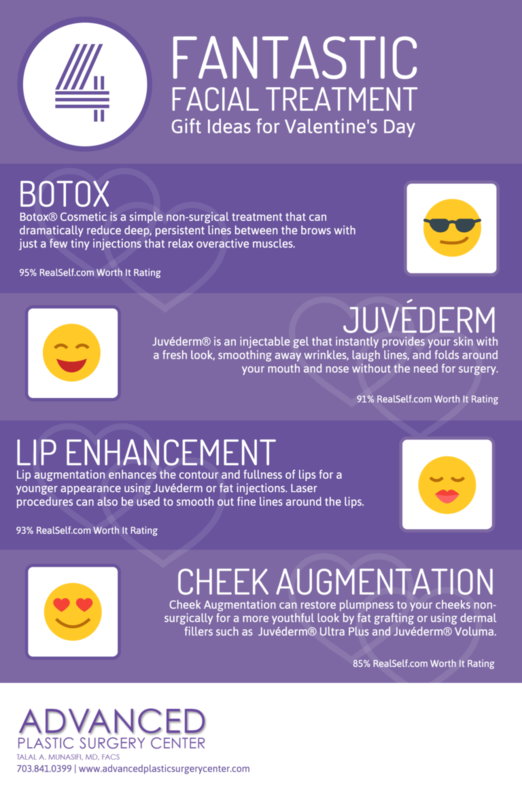 These facial procedures make excellent gifts for Valentine's Day! For more information on these procedures, contact Advanced Plastic Surgery. Botox Cosmetic is a simple non-surgical treatment that can dramatically reduce deep, persistent lines between the brows with just a few tiny injections that relax overactive muscles. Botox has a 95% RealSelf.com Worth It rating. Juvederm is an injectable gel that instantly provides your skin with a fresh look, smoothing away wrinkles, laugh lines, and folds around your mouth and nose without the need for surgery. Juvederm has a 91% RealSelf.com Worth It rating. Lip augmentation enhances the contour and fullness of lips for a younger appearance using Juvederm or fat injections. Laser procedures can also be used to smooth out fine lines around the lips. Lip enhancement procedures have a 93% RealSelf.com Worth It rating. Cheek Augmentation can restore plumpness to your cheeks non-surgically for a more youthful look by fat grafting or using dermal fillers such as Juvederm Ultra Plus and Juvederm Voluma. Cheek augmentation has an 85% RealSelf.com Worth It rating.